You will be advised by Friday November 29 if your request has been confirmed. You'll then need to book your seats by noon on Tuesday December 3, or we may need to release them to the waitlist to ensure all spots are filled. We have limited seating and while we try to accommodate everyone who is interested, that is usually not possible - most events are filled very quickly. Due to space limitations, we will be limiting people to 2 spots per request, though if you're interested in more let us know and your request will be added to the waitlist. There will be a wine pairing (or a la carte beverages) available, or you can BYOB. experiment #38 - choose pairing? Another experiment successfully concluded - this time around, with Chef Jose Mendin of Pubbelly and PB Steak. Mendin played host to nearly 60 guinea pigs at PB Steak, and put together an offal-intensive, "Bloody Monday" menu that focused mostly on all the bits on the animal other than the steak. It was very well done and very much in the spirit of what we try to do. You can see pictures in this CobayaBelly flickr set, or in this flickr set from Y'All Taste This, or scroll down a bit in Chowfather's Instagram feed. And here are recaps at Food For Thought and The Chowfather. A huge thank you to Chef Mendin, to Pubbelly partner Andreas Schreiner, to all of the crew in the kitchen, behind the bar, and in the front of house, who did a fantastic job accommodating our big group, and as always most of all, to all of the guinea pigs (including both some veterans and lots of new faces) whose interest and support makes these events possible. 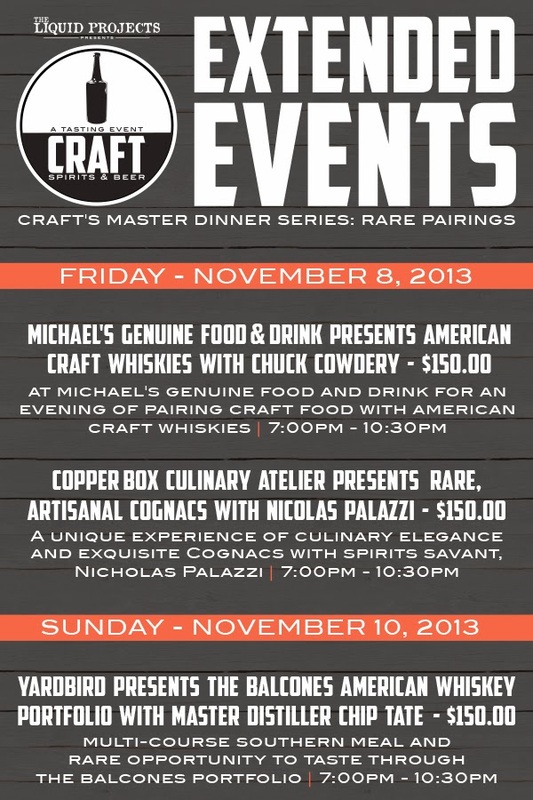 As another "Friends of Cobaya" alert, we bring to your attention the Craft Master Dinner Series, part of the Craft Spirits & Beer program running November 8-10, 2013, which has been spearheaded by Cobaya regular Jennifer Massolo. 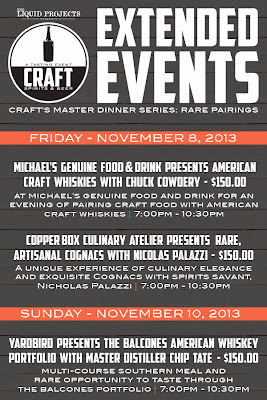 The dinner at Copper Box Atelier in the poster above is already sold out, but you can still get spots at the November 8, 2013 dinner at Michael's Genuine Food & Drink, with pairings orchestrated by highly regarded whiskey maven Chuck Cowdery. You can get a little preview of the dinner here at the Genuine Kitchen, and you can purchase seats ($150pp) here through Eventbrite. Mention Cobaya and you will get a VIP Pass to the November 9 Tasting Gallery too! November 21, 2013: Chef Jason Wang of New York's Xi'an Famous Foods and Biang! Restaurant supposed to be popping up at Khong River House. November 24, 2013: P.I.G. #4 with Chef Jeremiah, and from what I hear, several special guests. For years Andrew Carmellini has put on a "Trufflepalooza" dinner at Locanda Verde in New York to celebrate the start of truffle season. When Hurricane Sandy interfered last fall, what started as a proposal to bring those truffles down here to Miami wound up as an excellent Hurricane Sandy Relief Dinner at The Dutch. 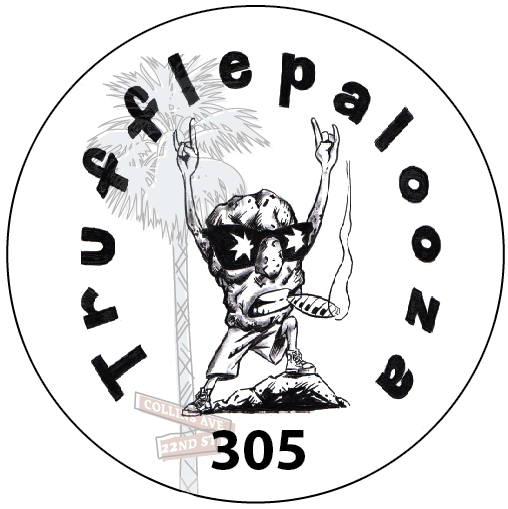 This year, barring more hurricanes, we're getting the truffles: Trufflepalooza 305 will be happening Wednesday November 20 at The Dutch. They will be doing something similar to the Locanda Verde Trufflepalooza event in the main dining room: 3 courses (a choice among 2 appetizers, 3 mains & 2 desserts) for $75, excluding tax and tip. But even better: they will also be doing a Cobaya-style special menu on The Dutch terrace for Cobaya Guinea Pigs. Five courses, a mix of plated and family style dishes, for $110 per person all in (inclusive of tax & tip). Considering what The Dutch did for prior events, you can probably guess which we think is the better deal. 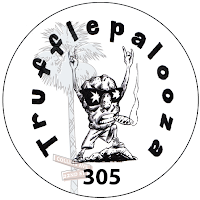 Details on start time for the CobayaTrufflePalooza will follow soon, and suggested wine pairings will be available for purchase at the dinner. Want in? The answer is "yes." We're selling seats on a first come first serve basis right here, link is below. 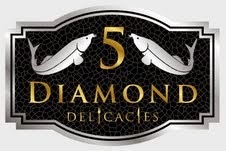 With thanks to 5 Diamond Delicacies, The Dutch's partner for Trufflepalooza 305. Almost exactly a year ago, Cobaya helped Andrew Carmellini raise more than $17,000 for Hurricane Sandy relief efforts with a dinner and auction at The Dutch. This year we joined up with Chef Daniel Serfer of Blue Collar on Biscayne Boulevard to help raise money for Susan G. Komen For the Cure - a cause that's particularly meaningful to Daniel, who lost his mother to breast cancer eleven years ago this month (last year he lit up his neon sign pink and donated the proceeds of certain dishes from the month of October to Komen). You can see all the pictures from the dinner in this Pink Collar flickr set, or check Chowfather's Instagram feed, or this set from Y'all Taste This. You can also read a recap here at Food For Thought and over here, Chowfather's 31-question interview with Chef Serfer. With forty guinea pigs contributing $150 a person, lots of suppliers donating product for the cause, and even Blue Collar's servers contributing their time for the evening, Blue Collar will be able to give $5,000 to Komen from our dinner. A huge thank you to Chef Danny, to all the staff at Blue Collar, to Allegra Angelo for pouring some great pairings (Allegra is a Cobaya vet - this was the third event she's poured for), and as always most of all, to the guinea pigs whose interest and support makes these events possible.